A thought-provoking approach to raising awareness of the benefits of 20mph speed limits has targeted drivers in the north of Edinburgh today (Thursday, 14 March). Councillors have voted to press ahead with taking trams to Newhaven. A major resurfacing project is under way on one of Edinburgh’s key thoroughfares. 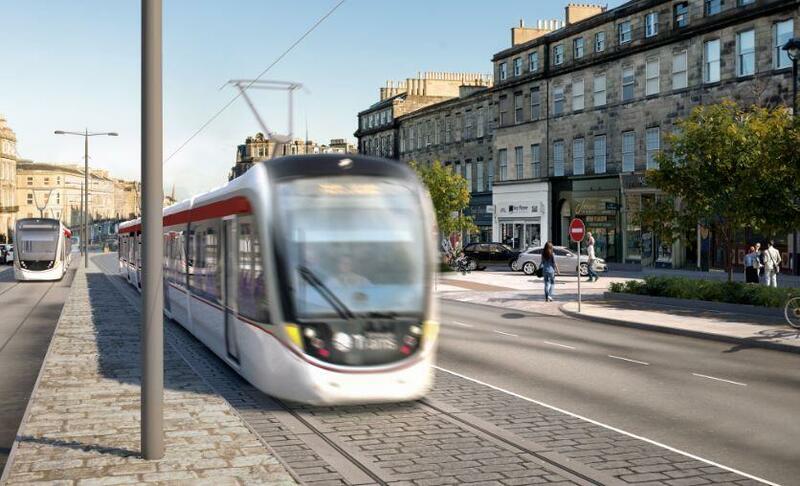 Contracts have been approved today for the two contractors for the potential Trams to Newhaven project, subject to the scheme being approved by the City of Edinburgh Council next week. An ambitious strategy to install a network of on-street electric vehicle charging ‘hubs’ across the Capital has moved one step forward, following approval by councillors. Councillors will be asked to approve the award of two separate contracts for the potential Trams to Newhaven project next week. 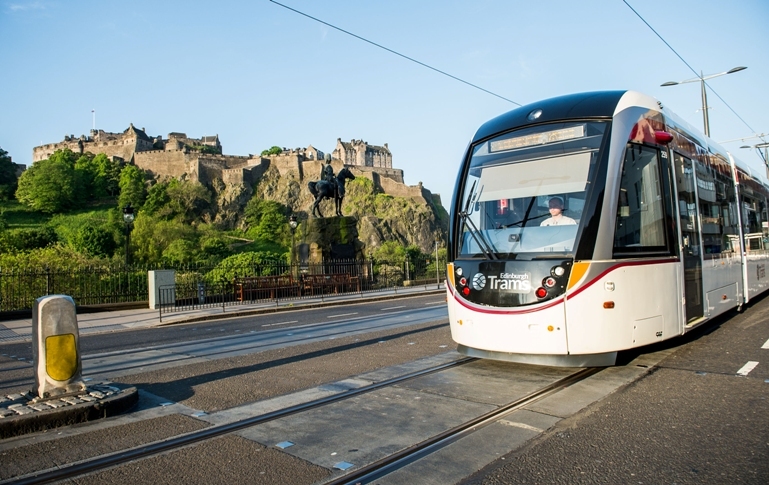 A long-planned transfer of responsibility for maintaining tram infrastructure from the City of Edinburgh Council to Edinburgh Trams Ltd is set to be confirmed by councillors next week. The weather may have taken a mild turn, but the City of Edinburgh Council is gearing up for whatever the winter has to throw at the Capital over the coming months. Plaza areas, people-friendly spaces and a dedicated cycleway are among potential new features for Edinburgh’s George Street and New Town public realm design project. Rugby fans heading to watch Scotland in the Autumn Tests 2018 this month are being advised to take note of traffic and travel information. The public is being given the first opportunity to see the draft concept design for Edinburgh’s George Street and New Town public realm design project. New energy efficient street lights are set to be rolled out across the Capital from next month, generating savings of £54 million for the city over 20 years. A citywide ban on all temporary on-street advertising structures, such as advertising boards (known as ‘A’ boards), will come into force next Monday (5 November). Councillors will make a final decision on whether or not to proceed with the Trams to Newhaven project in early 2019, it was announced today. Earlier in the summer, the Council's Trams to Newhaven project team embarked on a major public consultation inviting residents and businesses to help shape designs and plans. Members of the public are being invited to have their say in a major new consultation about how people want the heart of Scotland's Capital to look, feel and function. Calmer speed limits have been the norm across much of the Capital since March this year, when the citywide rollout of 20mph to residential roads, shopping streets and the city centre was completed. Businesses along the planned tram route to Newhaven will have their say on a raft of innovative and exciting support for business proposals in a new consultation beginning next week. A major public consultation planned to kick off next month will spark discussions all over the city about how people want the heart of Scotland's Capital to look, feel and function. As stars of the Big Screen flock to the Capital for the 72nd Edinburgh Film Festival, a group of fledgling film-makers from local schools had their own red carpet moment. Edinburgh's Transport and Environment Convener, Councillor Lesley Macinnes, has announced plans to work toward regular, vehicle-free days in the capital’s city centre. Views are being sought from the public as part of a project to improve key streets between the Meadows and George Street in Edinburgh. An arresting new video starring Edinburgh primary school children highlights the importance of sticking to the speed limit. Thousands of people shared their views in a major consultation about plans for taking trams to Newhaven, which closed at the weekend after six weeks. Final designs for the road layout and kerb lines on Picardy Place have now been agreed by the Council following further discussions with cycling and pedestrian organisations and the local community. Events aimed at encouraging more and more people to walk and cycle are to be held in each of the four Edinburgh localities for the first time this year as part of a calendar of active travel events. New Advanced Stop Line (ASL) boxes for cycles have been installed at key locations under the second phase of a raft of safety improvements along Edinburgh's tram route. The City of Edinburgh Council is set to keep the city moving throughout wintry conditions forecast this week. Residents, businesses and other interested parties are being given the opportunity to influence a future design for George Street and the surrounding area. Draft detailed designs for a section of the approved City Centre West to East Link were on public display on street in Roseburn today [Tuesday 5 December 2017]. Motorists using the A90 are being advised to allow extra time for their journeys this weekend while Burnshot Bridge is being demolished. Further improvements have been made to the proposed designs for Picardy Place ahead of a series of public engagement events. The public are being invited to view and comment on proposals for the future layout of Picardy Place and the surrounding area. As the clocks are wound back and Guy Fawkes Night approaches, winter is well on its way, and Edinburgh is fully prepared for the colder months ahead. Changes to the layout of Silverknowes Roundabout have been agreed to help make it safer and more user-friendly for those on two wheels, as well as pedestrians. New red-surfaced cycle lanes are to be installed at a number of key points along the tram route in Edinburgh's city centre. The Outline Business Case (OBC) for taking trams to Newhaven was approved today by the City of Edinburgh Council. Two innovative City of Edinburgh Council active travel projects have been awarded millions of pounds in funding, it was announced today. A footbridge across Leith Street is set to be removed this weekend as part of works to facilitate the delivery of the Edinburgh St James development. The Outline Business Case (OBC) for taking Edinburgh’s tram service down to Leith and Newhaven has been published on the Council’s website today. Children from the latest area of Edinburgh to 'go 20' displayed their road safety-themed artwork at the Scottish National Gallery of Modern Art today as 20mph Phase 3 gets ready to go live. Councillors are set to consider further the feasibility of taking Edinburgh Trams to Newhaven. A plan to improve the way the Council carries out road repairs is set to go before councillors later this week. Primary school children have been creating vibrant 20mph-themed artwork in support of the ongoing rollout of slower speeds to residential, shopping and city centre streets across Edinburgh. Pupils and teachers across Edinburgh have joined a campaign to discourage inconsiderate parking at school gates. Applications are invited for an Edinburgh Playing Out pilot project which would see residents in eligible streets organise temporary road closures for children's play events. Mascots from Hibs and Hearts joined 20mph champion The Reducer and officers from Police Scotland on the track at Meadowbank Sports Centre today to mark the kick-off of Phase 2 of 20mph in Edinburgh. Rugby fans heading to watch the Six Nations matches at Murrayfield in February and March and those travelling nearby are being advised to take note of travel arrangements. Transport Convener Councillor Lesley Hinds was today joined by utility companies in signing a public pledge for responsible management, coordination and communication of roadworks in Edinburgh. Air quality in the Capital is getting better, a new report to the Council's Transport and Environment Committee shows. A young woman who sustained life-changing injuries in a road traffic collision will share her experience with young Edinburgh motorists at a multi-agency road safety education event this week. Positive statistics from monitoring stations at key locations in the Capital show a marked improvement in air quality so far this year compared to 2015, with 97% of streets meeting required standards. Representatives from Edinburgh and Midlothian today jointly celebrated the success of a £1.9m cross-boundary cycle and walking route ahead of National Cycle to Work Day 2016. Work is set to begin on the next stage of a major project to improve Leith Walk. Members of the Council's Transport and Environment Committee today agreed to proceed with an ambitious project to create a family-friendly west to east cycle route through the city centre. A pilot to reduce traffic outside primary schools in Edinburgh has seen walking to school increase amongst participating pupils. Residents are invited to help shape improvements to some of Edinburgh's dedicated routes for walking and cycling. Police Scotland and Sustrans Scotland joined the City of Edinburgh Council's Transport Convener today to mark the launch of the first zone in the Capital's new 20mph limit rollout. The mascot for Edinburgh's new 20mph limit has been unveiled at a special ceremony in the City Chambers. In response to public feedback, some changes are proposed for parts of a planned family-friendly cycleway between Roseburn and Leith Walk, ahead of a decision on the route by councillors in August. A vision for the layout of Edinburgh’s George Street is set to be considered by councillors next week. Signs and lines advertising the soon-to-be-effective new 20mph speed limit are being installed in parts of Edinburgh's city centre and rural west area from this month. Councillors are set to decide how parking controls could be introduced on Sundays following the proposal's approval in principle earlier this year as part of the Council's draft Parking Action Plan. The City of Edinburgh Council is set to install hundreds of new cycle racks across the capital. Strides to improve air quality in Edinburgh received a welcome boost today with the approval of a new citywide car club scheme for the Capital. A new initiative by the City of Edinburgh Council is set to tackle the capital’s worst potholes and road defects resulting from winter weather. Edinburgh is close to becoming Scotland’s first 20mph city after Councillors approved plans to begin rolling out the speed limit. A second phase of Edinburgh’s School Streets initiative is to be launched early this year. The City of Edinburgh Council is to introduce a temporary bus service to reduce parking and traffic pressures in South Queensferry during the closure of the Forth Road Bridge. The Council is taking steps to ensure business as usual in Edinburgh during the Forth Road Bridge closure. Councillor Lesley Hinds presented Mike Robertson, Transport Manager of George Anderson & Sons with an inscribed glass plaque, to mark their status as the 100th Member of ECOSTARS Edinburgh. The Council is set to begin consultation on proposals for a major cycle route linking the east to the west of the city. The public are invited to share their views to help shape the future of one of Edinburgh’s key thoroughfares. Colinton Primary School pupils have celebrated the launch of the School Streets initiative in Edinburgh. The public’s views are sought on a raft of measures aimed to help improve parking in Edinburgh. The public are invited to help shape the future of one of Edinburgh’s key thoroughfares. Council Leader, Andrew Burns and Convener of the Regulatory Committee, Cllr Gavin Barrie met with charity campaigner, Gordon Aikman yesterday to discuss concerns about taxi accessibility in Edinburgh. The first phase of a £1.25 million scheme to link the Innocent Path cycleway to the Union Canal towpath via the Meadows is scheduled to get under way from Monday 9 March 2015. The next phase of the Leith Programme is due to get under way on Monday 16 February 2015, focusing on upgrading the junction at the Foot of the Walk. Edinburgh's bid to become the first 20mph city in Scotland moved a step closer today when councillors approved a map of 20mph, 30mph and 40mph limits for the city. A large swathe of roads in the Capital could change to 20mph from late 2015 if plans are approved this month, making Edinburgh the first 20mph city in Scotland. A public consultation is now live as part of a new pilot school streets initiative for the Capital. With wild and wintry conditions heading our way, Edinburgh's residents are urged to heed advice on how to keep themselves, their properties and their vulnerable neighbours safe in bad weather. Rugby fans heading to watch Scotland in the viagogo Autumn Tests 2014 this weekend are being advised to take note of traffic and travel information. Winter is coming - and the City of Edinburgh Council is getting ready for it. A recruitment drive is now under way for members of two groups involved in developing active travel policy for Edinburgh. Consultation is set to get under way in 11 school communities across Edinburgh over the coming months as part of a new pilot 'school streets' initiative. A consultation is now live seeking people's views on new cycle route proposals connecting Marchmont with King's Buildings. The Council has landed a prestigious industry accolade for 'turning around' the Edinburgh Tram project. Plans to begin the second phase of a multi-million pound flood prevention scheme in the Capital were given a boost when funding was approved. The Council will address a national cycling conference later this year as other organisations look to follow Edinburgh's lead in a pioneering cycle training scheme for lorry drivers. Road resurfacing works will get under way at the foot of Dundas Street from Monday 15 September, scheduled to last three weeks. A march organised by the Grand Orange Lodge of Scotland will take place in the centre of Edinburgh on Saturday 13 September 2014, requiring a number of road closures. The following press release has been issued by Transport for Edinburgh to mark the first 100 days of trams in the Capital. The second phase of work to improve access for pedestrians around Waverley Station will get under way on Waverley Bridge on Monday 8 September, scheduled for completion in December. Motorbikes could soon be allowed to join buses, bicycles and black cabs on Edinburgh's bus lanes if a report to councillors gets approval this week. Edinburgh Trams will run a series of simulated 'tram recovery' tests over the coming days as part of a comprehensive pre-service tram testing and driver training programme. Plans for traffic management around the Royal Commonwealth Pool in Edinburgh during this summer’s Commonwealth Games have been revealed. The initial phase of a project to spruce up Coates and Atholl Crescents in Edinburgh's West End will start next week. Edinburgh's taxi examination centre is to be run by the City of Edinburgh Council after the Regulatory Committee today agreed to the move. The next phase of a major programme of investment into Leith Walk is set to move a step closer. Organisers of today's Exercise Salvador event have paid tribute to members of the public for their help and enthusiasm. Rugby fans heading to watch Scotland in the 2014 RBS Six Nations this weekend are being advised to take note of traffic and travel information. Take a look at the whole tram route from Edinburgh Airport to York Place thanks to a new Edinburgh Trams video. Edinburgh Trams is seeking volunteers to help evaluate crowd management procedures at the Murrayfield Stadium tram stop next month. Residents, commuters and pedestrians in Edinburgh will start to see more trams being tested along the route over the coming days.